BEIJING - Following its global marketing campaign for 'responsible driving' during the World Cup period last year, Budweiser has launched a six-month long 'Say no to drinking and driving' campaign in China on microblogging site Sina Weibo. 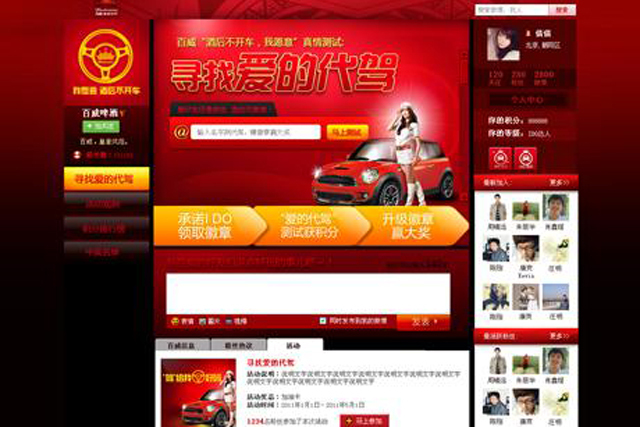 Wwwins Isobar China, the digital AOR agency for Budweiser of Anheuser-Busch InBev China, is behind this integrated campaign featuring microblogging site Sina Weibo as the main digital platform. The campaign is also supported by offline activity including TVCs, posters and PR events in China. On the dedicated Sina Weibo campaign site, the brand is encouraging drivers to make a commitment to not drinking and driving in order to receive a tailor-made Sina Weibo 'I do' badge on his or her personal page. The goal is for participants to find their favourite designated drivers among their own Sina Weibo friends, willing to drive them home after a night out drinking. The 'I do' badge is part of a five-level accumulated reward system. Those who reach the top level will have the chance to enter into a lucky draw for rewards including public transportation cards (China version of Octopus cards in Hong Kong), petro cards (for free petro), and a chance to win the services of a personal designated driver with a nice car for one year. The second phase of the campaign, which will start on 1 May, is to encourage participants to invite new friends added on Sino Weibo to get connected in real life for social 'happy hour' events.